This Alternating pressure pad system prevents bedsores and relieves painful pressure points. The quite pump inflates 130 individual bubble cells preventing decubitus ulcers from developing. This air mattress is designed to fit over an existing twin mattress or bed. This mattress is also used over medical bedframes, gel mattresses, and even on reclining chairs. 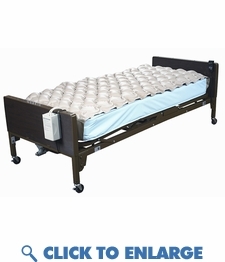 App pad and pump systems are entry level air mattresses used to assist with the treatment of bedsores. This cost effective air mattress will immediately help to reduce painful pressure points and will heal and prevent basic bedsores. Ideal for home care use to prevent and heal bed sores. This alternating pad system can fit over a twin bed , standard hospital bed, or hospital mattress. replacement app pads available too. � Pump produces 4 LPM air flow. � 5 minute cycle time. � Easy to change filter. � Bubble pad design provides superior therapeutic treatment. � Built in bracket for mounting easily to bed. � Pad is made of long lasting durable heavy gauge premium vinyl. � Pad size 78" x 34"
� Height of inflated cell 2.5"
� 130 individual bubble cells for maximum effectiveness. � 300 lb. Weight Capacity. � 90 day Warranty on mattress. � 1 Year Warranty on the pump.